This was our first time to camp at a Casino. The Gold Ranch Casino RV Park is an impressive place. We camped here for 3 nights during the third week of September 2018. The RV park grounds were very well maintained with enough space and grass between RVs to make it quite comfortable. The RV park has paved roads and concrete pads to park on. It was very easy to pull into our site where water, sewer and 50 amp electric was available for $47.66 a night. We used the very nice and clean laundry facility, public restrooms and outdoor pool. 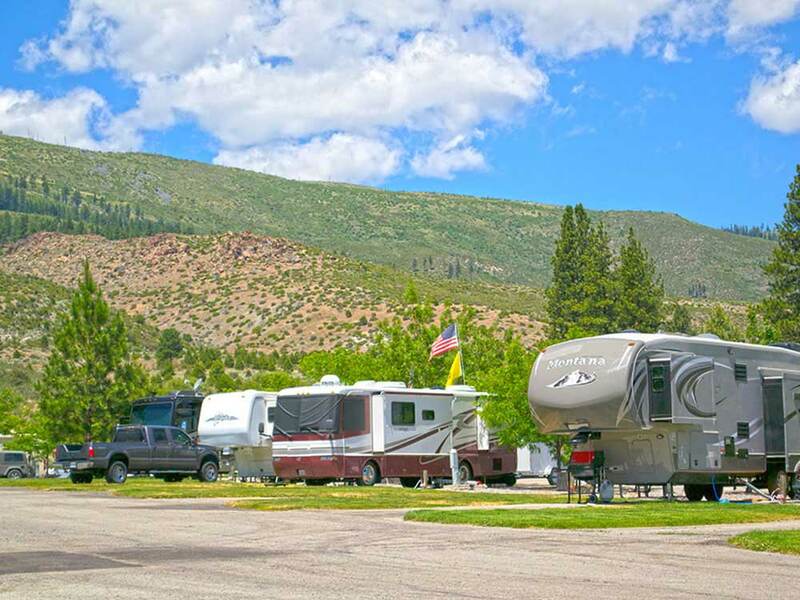 The RV Park is close to midway between both Reno, NV and Lake Tahoe good location. The RV park was quite full during our stay there, you would be advised to have a reservation before you come here. Although the park was full and busy, it was surprisingly quiet overnight. We encountered very helpful and friendly people at this RV park. Great hospitality! Next time through this area, I'd stay here again. Paved roads, concrete sites, and lotsa trees make up this campground. Has great security. Peace and quiet is abundant. I didn't want to leave. Restaurant, casino, quickie mart, coffee shop, fast food, and more. Beautiful scenery all around. We'll be back. Our stay here was one night, but we found the accommodations and staff to be very pleasant. A storm was moving in quickly as we arrived and the staff worked with us to get registered and set-up before it hit. We were very pleased and look forward to returning for a future visit to the area. Nice clean park. Th staff was friendly and helpful. Nice surrounding views with a small walking trail, and within walking distance to casino. Sites are paved, long, big rig friendly, but slightly narrow (although able to open all 3 slides), unlevel side to side, but manageable. We had a problem getting into the site due to low hanging tree branches. This was a problem on many other sites as well. Good space between sites with well kept grass. Traveled in 5th wheel. Would stay again. This was a very nice park. The staff are very friendly. We had a pull-thru spot near the mountain hiking trails. The main club house was on the other side of the park, but you could walk to the pool and club house in less than 3 minutes. We traveled with a 3 year old and did not see a lot of kids, so this was a bit of a bummer for us, but it was April so maybe a lot of families not traveling with kids. They have a great library and movie selection at the club house. They need a few more kid movies. We live close so we are going to donate a few to them ;). They also have security that drives thru the park. If you need a place to stay on your way to California this would be a great park to visit. Great stopover on the way to Reno/Lake Tahoe, NV area. Pull-thru & back-in sites, full hookups. We got in very late & there were spaces available. Casino on the same property if you want to gamble a little. Also gas station, mini-market & restaurant. A couple of fast-food restaurants too--although we only stayed one night & didn't try them out. Beautiful location, surrounded by the mountains. We'd stay here again any time. For an exciting unforgettable gaming experience, Gold Ranch is your best bet. Sign up for our 'My Party' club and watch the points roll in. Earn bonuses, cash prizes, comps, and enter tournaments for even more non-stop fun.